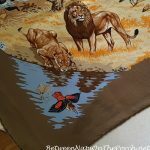 For next week’s Metamorphosis Monday, if you would like, please share a photo (or two) of 5-10 of your most favorite “Before and Afters” that you’ve posted in the past on your blog, along with links back to those previous posts. They can be Before and After posts that you’ve linked up for Met Monday in the past, or they can be Before and Afters you’ve never linked up. Whatever you would like to share in your Met Monday post next week will be great! 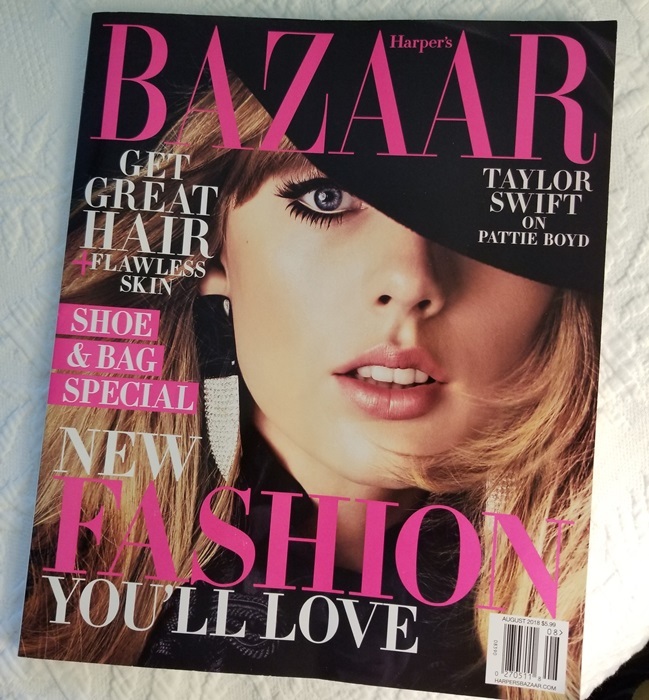 When I was in the Dayton airport recently about to take off to head back home, I picked up an issue of Harper’s Bazaar. 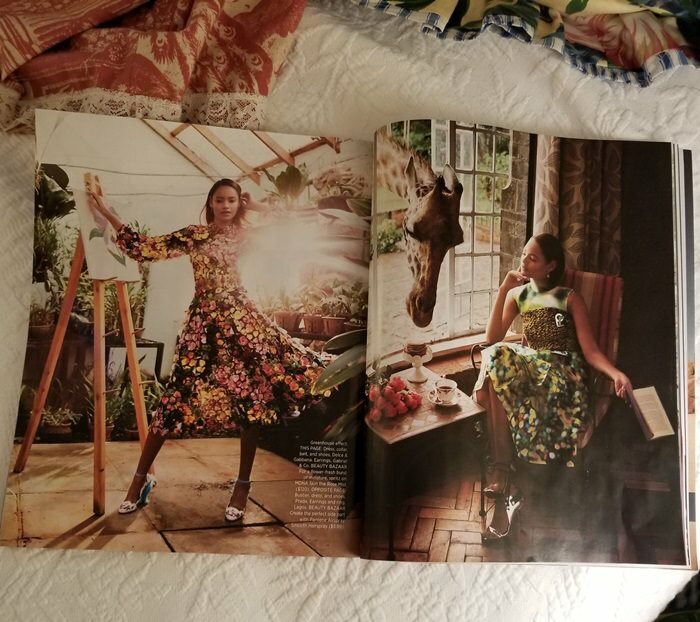 I don’t buy magazines anymore since I can pretty much get my fill of home design and fashion online, but I couldn’t resist this issue when I flipped through and came across these photos. Recognize this scene? 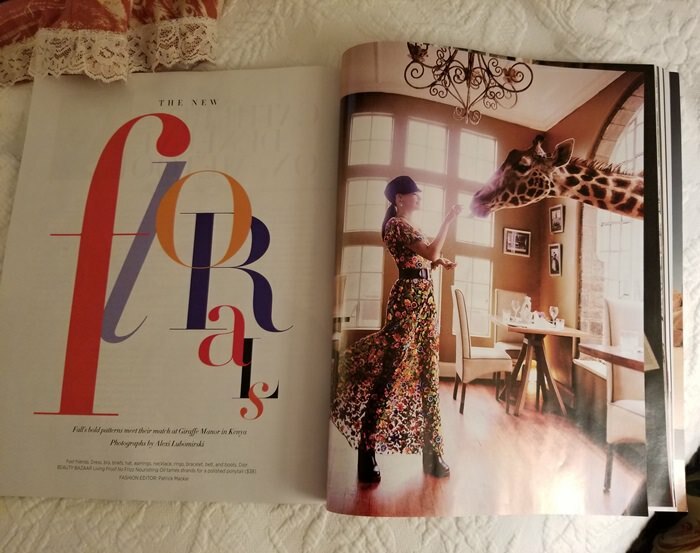 Harper’s Bazaar did a fashion shoot at one of my favorite spots on earth, Giraffe Manor! 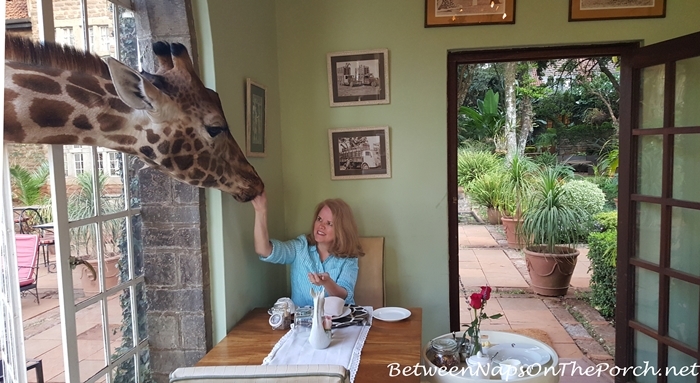 If you would like to read more about Giraffe Manor, you’ll find all the posts I’ve written about that trip to Kenya here: Travel to Giraffe Manor and Mahali Mzuri. My Hat is Off to the Air Traffic Controllers at Atlanta Hartsfield-Jackson Airport. I was a tad nervous arriving in Atlanta this past Sunday on my trip back home from Ohio. I flew in Sunday evening and as we were approaching the runway but still a minute or so out, I could see sooo many planes out my window. I was sitting on the right side of the plane and there were 2-3 planes out the window to the right and another one flying past us overhead. 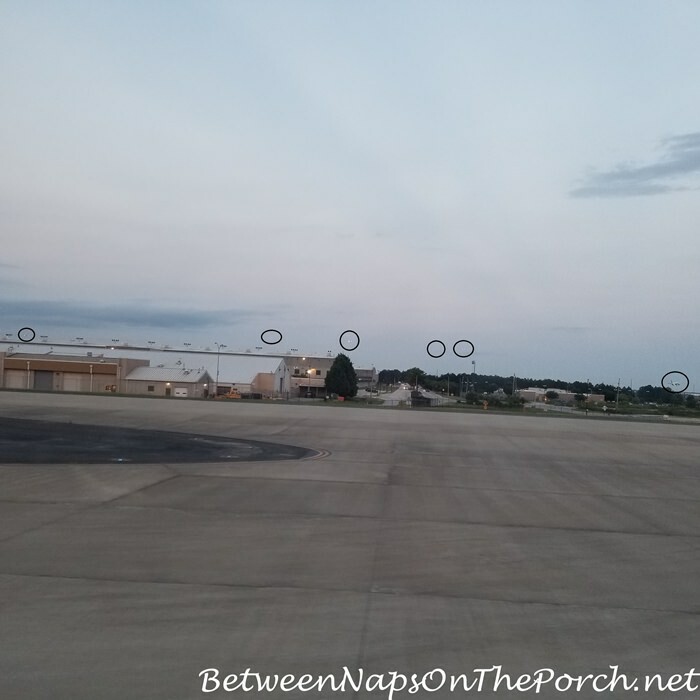 It was like a swarm of planes with the airport being the hive It kinda freaked me out a bit. I’ve never seen the skies so busy when flying into Atlanta. I don’t know how the air-traffic controllers do their jobs so efficiently, much less sleep at night! Even after we landed, we had to sit for a while in a taxi area waiting for all the planes to land or take off so we could “drive” over to gate. At one point, as we were just sitting and sitting, a runway that was parallel to the one we were sitting on had huge jets taking off literally every 45 seconds or so. One would take off and then about 45 seconds later (if that long) another would take off. Then another, and another, another. They must have been all lined up, just waiting their turn. When we finally were able to move and start crossing over the runways to get to our gate, I looked out my window again and saw this below. I know it’s hard to see but all those circles are airplanes in the air–and that’s just the ones I could see through the haze. Most I think were lined up to land, but the one on the far right had just taken off. I know the Atlanta airport is the busiest airport in the world, but, Wow…seeing is definitely believing. How do they keep everyone apart?! My hats off to those who work Air Traffic Control. I always thought being a doctor or a surgeon was an incredibly tough/stressful job since they have the life of a patient in their hands when they operate, etc… But just think how many lives are in the hands of an air traffic controller each and every day. When’s the last time you heard of two planes colliding at the Atlanta airport? I don’t ever remember that happening a single time. Truly air traffic controllers deserve every penny their earn and more! 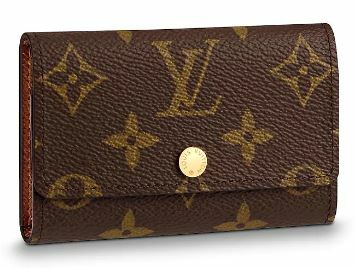 I have never purchased anything by Louis Vuitton until a few months ago when I purchased their Six-ring Key Holder. I had been hearing YouTube fashion bloggers raving about the key holder for literally years and finally decided to try it. 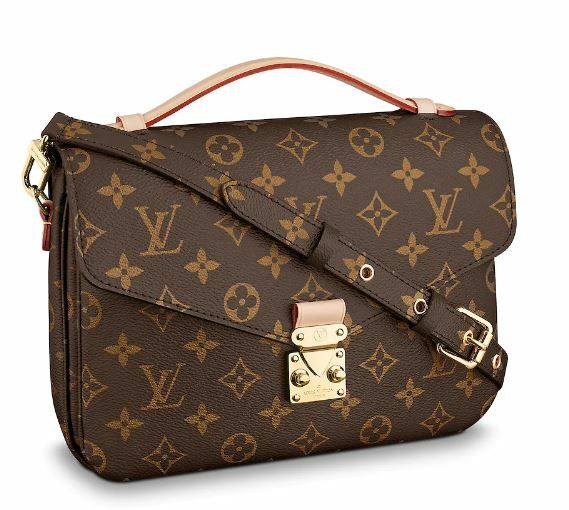 Another LV item I’ve continually seen getting rave reviews is Louis Vuitton’s Pochette Metis handbag. I think the reason I’ve resisted buying LV products all this time is I’m not normally a big fan of anything that’s covered in a brand’s monogram. I don’t mind a single logo on a bag somewhere, but the traditional LV monogram had always seemed a bit much. That was until I came across a beautiful antique trunk in the Louis Vuitton in Whalers Village during a vacation to Maui recently. I can’t find the photo I took of the trunk when I was there, but it was gorgeous! I was shocked to see it covered in the traditional LV monogram. I had no idea how far back their classic monogram canvas dated, it goes all the way back to 1896! Here’s a photo I found at the Louis Vuitton Whalers Village website showing the interior of the store. The antique trunk is on display there on the left. I like they have it showcased, such a beautiful piece! Here’s a bit closer view…the warmth of the wood around the trunk was so beautiful! That was the moment my heart softened for Louis Vuitton and their famous monogram print. The antique trunk won me over! BTW, there are several gorgeous antique LV trunks on the website, 1stdibs. They are expensive but really beautiful. …I saw the reverse monogram version. I loved the contrast the golden-brown color added to the bag and decided to finally purchase it. Ignore the twilly I have across the handle. I put that on last night just for fun. Unfortunately, because this bag is always in such high demand, it can be difficult to find. I’ve been on a wait list for a while and was finally called this past week. The handle on the regular Pochette Metis is Vachetta Leather. 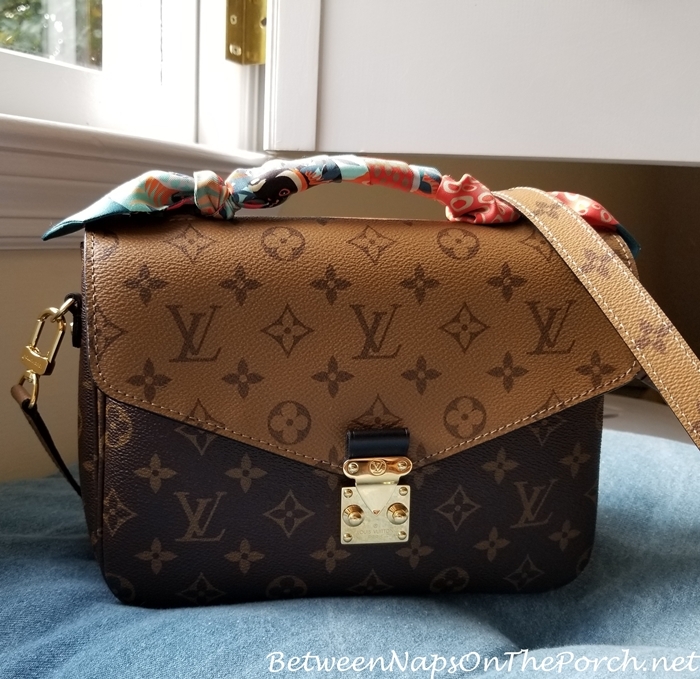 I don’t own any other LV bags so have no experience with that type leather, but from what I’ve learned watching YouTube reviews of the bag, it is easy to damage if you’re caught in the rain or get something splashed on it. This is the product I’ve heard so many folks say they use to protect the Vachetta leather. In the videos I’ve watched, they covered up the rest of the bag and sprayed just the leather sections. It supposedly keeps the leather looking beautiful. It still ages to a natural warm brown as leather does, but apparently, the Apple Guard protects it from rain and such. If you own any Louis Vuitton handbags or products with Vachetta leather that need protecting, you’ll find this protectant here: Protectant for Leather. The way I’ve seen it applied was spraying on a few light coats, letting the leather completely dry between coats. The leather will turn dark when first sprayed/treated, but then lightens back up as it dries. You’ll find quite a few videos online with YouTubers describing the process and how it worked for their bag. Please note: I have never used this product, although I did buy some to use on other leather products that I own. So I can’t vouch for how it works on Vachetta Leather personally, just passing along what I’ve heard so many times in reviews on YouTube. Also, check out the reviews at that link above where you’ll read about others who have used it on Louis Vuitton handbags. Hope this is helpful for those who carry Louis Vuitton bags with the exposed Vachetta leather. Next PostAqua Blue Wine Glasses and Soft, Warm Sand…Ahhh, How I Do Love Summer! Previous PostA Plain Brick Home Gets The Most Beautiful Transformation! Love!!! Loved Ladies of Letters! I have Acorn TV and watched that some time ago. 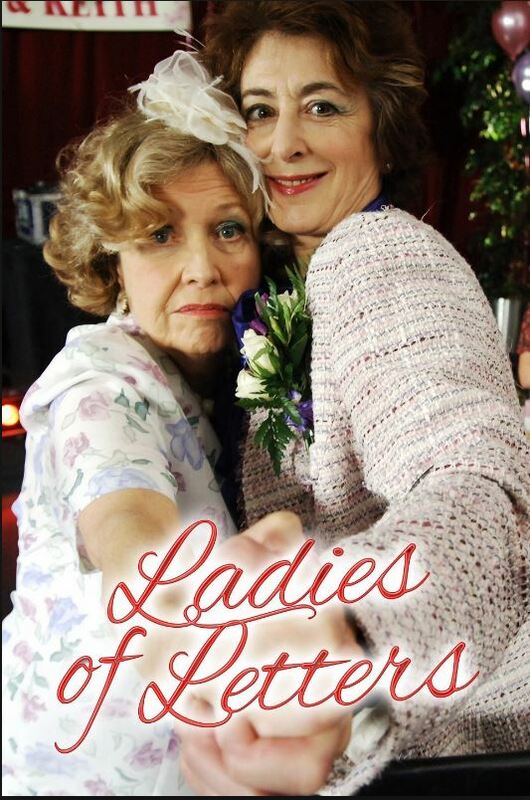 Love, love, love British TV shows! I do, too! Love Acorn TV! Aww, thanks Linda! You will love that shirt! So glad they brought it back! Love the LV purse you bought & many thanks for the recommendation on Acorn TV. I haven’t watched anything else in several months, love it soo much! Check out Good Karma Hospital, it is filmed in India & has beautiful scenery, one of my favorites on Acorn. So glad you like it, I love it, too! I think it was a BNOTP reader who first recommended it to me. I will check out Good Karma Hospital…thanks for the recommendation, Sabrina! I adore your new bag! I purchased my first LV bag 35 years ago and then another a year or two after that, as well as a wallet I LOVED. I didn’t carry them all the time, but often enough to get them good and “broken in”. Unfortunately, they were stolen from my home by one of two different appliance repair people who where in my home when I was not there ( I was a renter at the time)! I didn’t miss them for a good while so I could not pinpoint who was the culprit. I still had the wallet, but we were burglarized last August and the thieves took my wallet out of the closet they ransacked, along with jewelry and other things precious to me. LV no longer makes this wallet so I did not replace it. So far I have not replaced the other two bags, because what was $1000 back then would easily be $2500-$3000 today. I am preparing to retire and am hyper-focused on saving. Still, I miss those bags because I thoroughly enjoyed them. 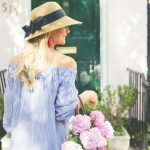 I have no doubt you will be hooked on the brand after this…they have so many lovely offerings and they last and LAST!!! I am thrilled for you over this latest acquisition! Susan, my dear, I LIKE THE WAY YOU THINK!!! And I agree…after all these years of working I do deserve a little something special. We will see what “shakes out”! 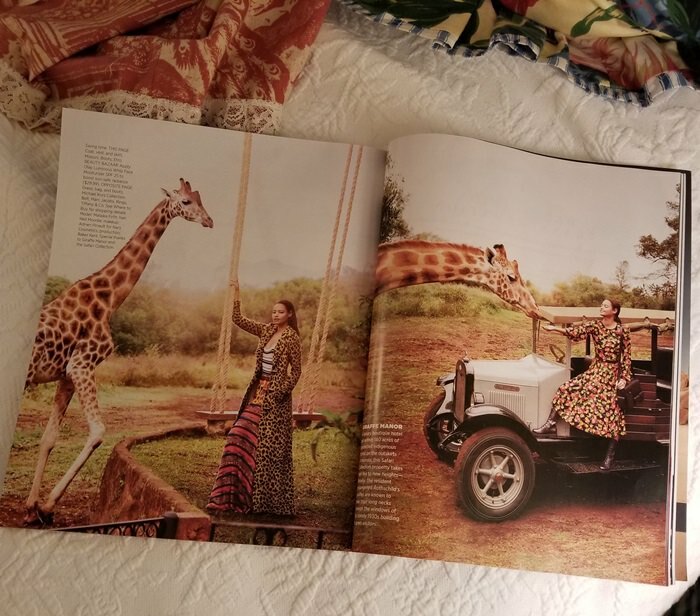 Love this blog and forgot to say that I loved the Giraffe photo shoot tie in to your previous trip. Such gorgeous creatures! Susan, do you know how to tell a real Louis V from a fake? Just curious? No, this is my first LV bag and I purchased it from the Louis Vuitton inside Saks in Cincinnati. Mary, if you are thinking about purchasing one that’s preloved, there are several things you can do. The easiest would be to purchase from a trusted reseller. Fashionphile and Vestiaire Collective are two that a lot of luxury YouTubers buy from. Also, another YouTuber I follow has purchased from Ann’s Fabulous Finds quite a bit and spoke highly of them. I would be very careful purchasing on eBay. I see sooo many fake Hermes Clic H bracelets on there. I’ve reported them so many times to eBay and they never remove them. I feel sorry for the folks who buy the fake bracelets. Some folks have to know they are buying fakes since they sell for about 1/10th what the bracelet actually sells for in the store. Also, if you Google how to tell a real Louis Vuitton bag from a fake one, you’ll find a lot of videos on YouTube and articles online describing what to look for, I’m sure. I see those type videos online for various brands all the time. The few times I’ve watched those type videos, they always say to pay attention to the stitching. Usually stitching on fakes can be pretty sloppy. But they have now what they call “Superfakes” out there that are almost impossible to detect as fake. 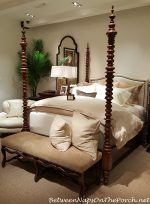 I won’t buy from Overstock. I purchased my DIL a Michael Kors bag from there that she really liked. When it arrived she felt it was a fake, so we returned it. She has several MK bags so she knows them well. I’ve heard that bad people will buy from companies like Overstock, then do a return, swapping the real bag with a fake and return the fake. If the fake is really, really good, I guess whoever handles returns may not realize it. Best bet is to buy directly from the store when you can, and if not the store, a really good reseller with who has an excellent reputation. I did order the Travelon bag you recommended for an upcoming trip. Thanks so much for your response recently when I asked about this. Hope you like it, Nancy! I’ll be taking mine to Egypt in October. It’s the only bag I would trust taking on a trip like that. After I ordered the blue dot shirt in just a few minutes decided I had better order the London print shirt. I’m happy that I did because I was told it was very popular and was selling fast. It, also, is 25% off. The saleslady told me she had bought one last week and loves it with jeans. I am ready to go now. lol Shockingly, it’s only like $4.99 a month or something like that. It’s such a deal and the programming is so much better than the stuff I used to see on TV when I have cable. I ditched cable (except for my high-speed internet) several months ago and haven’t missed it at all. Great variety of topics, thanks Susan. Your blog is like reading the best magazine because you cover so many different topics. We, in blog land love it and you! ♥️ I don’t subscribe to Acorn, but have watched many of their productions. Have you ever seen Foyle’s War? The setting is England during WWII and a detective and his team who solve murders,crimes, etc. Really good viewing, not gorey. Aww, thanks Cyndi! Love and appreciate you! No, I haven’t seen that. So it’s not too sad? I can’t handle sad movies. I’m a wuss! Love the bag! Nice to know about Acorn. Never heard of it! You going to Egypt in October?! Woo hoo. Can’t wait to hear all about it. 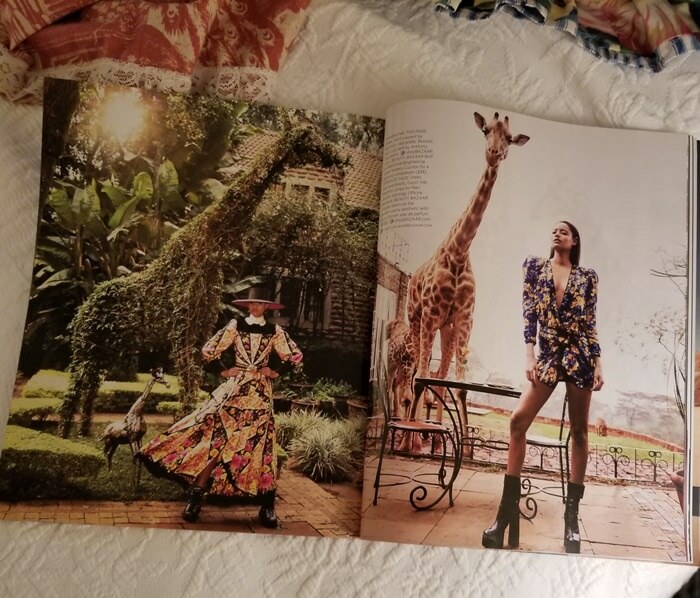 I like your picture at Giraffe Manor better than Harper’s, really, no kidding! Thank heavens for British TV, right? And the LV bag is lovely. Side note: A long-ago friend and fashionista told me that one can always tell a true LV in that there are never any seams through the logo. BTW, have you visited this website: https://www.ebth.com/ Everything but the House, estate sales? Even if you don’t buy it’s great to browse. I will check out that site…thanks for the tip…sounds interesting! Did I just write “they’re” instead of “their” ? It’s been a long day …..
Hello. Can you please discuss the scarf you have on the handle of the bag? I think I have seen something similar on Ebay, but I was curious about yours. Thank you. 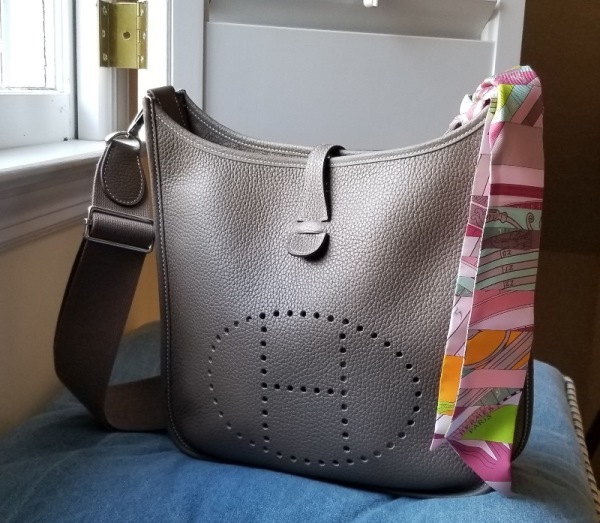 Hermes twillys are kind of expensive since they are silk, but I’m sure other companies make them that aren’t as expensive. Thanks so much, Fran! I wish I did but I haven’t ever Scotch guarded anything myself. I’ve only had it done professionally when I had a sofa cleaned professionally by a carpet cleaning/upholstery cleaning company. Fran, read some of the “questions and answers” on those products before ordering them. I always learn so much when I do that on the products I purchase on Amazon. Let me know if you use one of those and how it works.